Russia - The main event of the evening saw one of its most dominant performances, as Russia-based Tajik Shavkatdzhon "Shavkat" Rakhimov (14-0, 11 KOs) impressively retained his IBO super featherweight title for the third time, destroying South African import Rofhiwa Maemu in four complete rounds. Awkward Maemu had nothing to present Rakhimov with, except, well, for awkwardness. He moved laterally (ran sometimes it seemed), ducked very low and threw from very unorthodox angles, then tried to grab and hold. Rakhimov, 24, was his opposite by showing classy orthodox approach, although it was hard to apply one to highly unorthodox Maemu. Yet, Rakhimov, who acquired his belt in September 2017, delivered several punches in round one to calm Maemu down, continued with smart pressure in the second and in the third rounds, and finally got the job done with two hard body-shot knockdowns in round four. Maemu (now 18-8-2, 12 KOs) came back to his corner after the fourth, and almost immediately signalized the fight was off. It will come into the record books as the TKO 5 - for the WBC #4 and IBF #5 ranked Tajik. 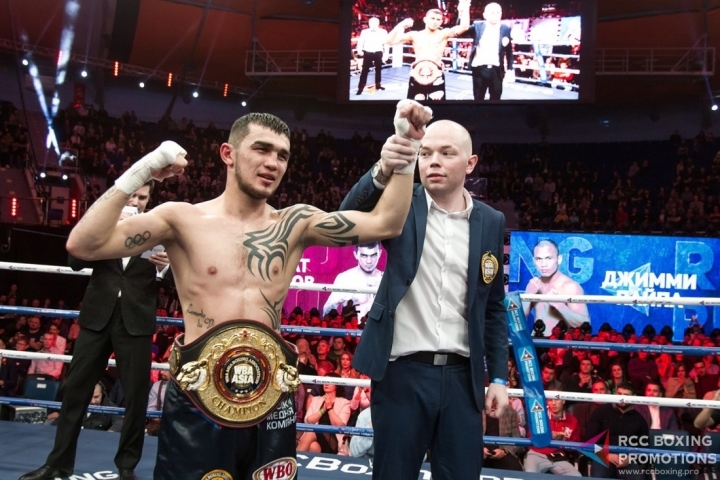 Rising Uzbek lightweight power Elnur Abduraimov made a quick work of Moscow-based Dmitry Khasiev (8-2-2, 2 KOs), stopping him at the conclusion of the second round. Brooklyn-based former multi-time continental and world medalist Abduraimov was aggressive from the starters, and thin, skillful but physically weaker Khasiev had little to jeep him honest. Abduraimov dropped Khasiev hard with a head shot midst into the second, and soon thereafter got the job done with a hellacious liver-breaker. Time was 2:58. Abduraimov is now 4-0, 4 KOs. Uzbekistani super bantamweight prospect Mukhammad Shekhov (4-0, 2 KOs), 26, improved his record further with a workmanlike unanimous decision over durable Belarussian veteran Andrey Isaev (30-15, 9 KOs). Shekhov was considerably better in a majority of rounds but lost his steam in rounds three and five. Isaev was durable and tough but his reflexes were considerably worse than those of Shekhov. Isaev, 38, was never in danger of being stopped but ate a solid number of hard, cumulative punches. He has lost the eighth straight fight since his last win in 2016.